Warmer weather will be here before you know it and when warmer weather comes so do the mosquitos. With all of the different things that mosquitoes are carrying these days, the last thing any of us want is to get bit. For my family though, commercial mosquito repellents simply won’t do. I don’t like the chemicals that are in those cans which means that I prefer to use a natural mosquito repellent. 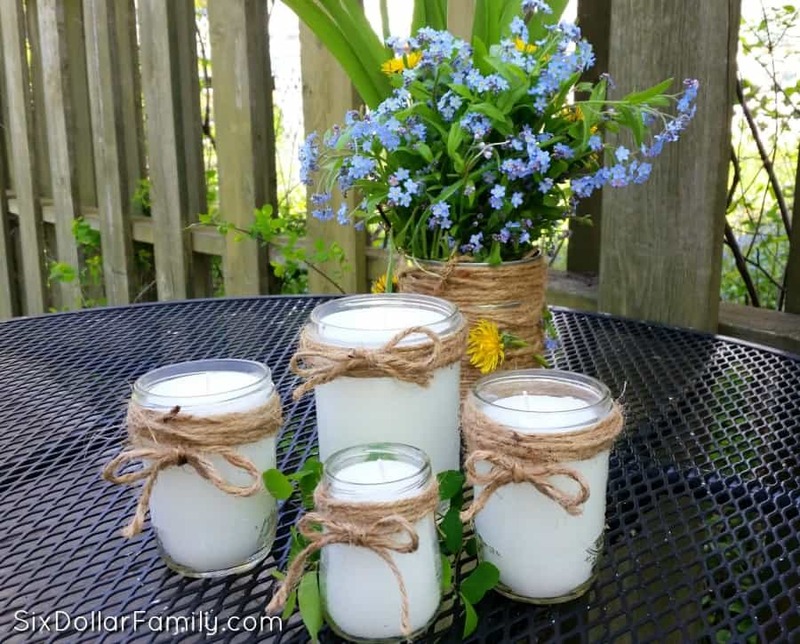 These DIY Citronella Candles are just that! 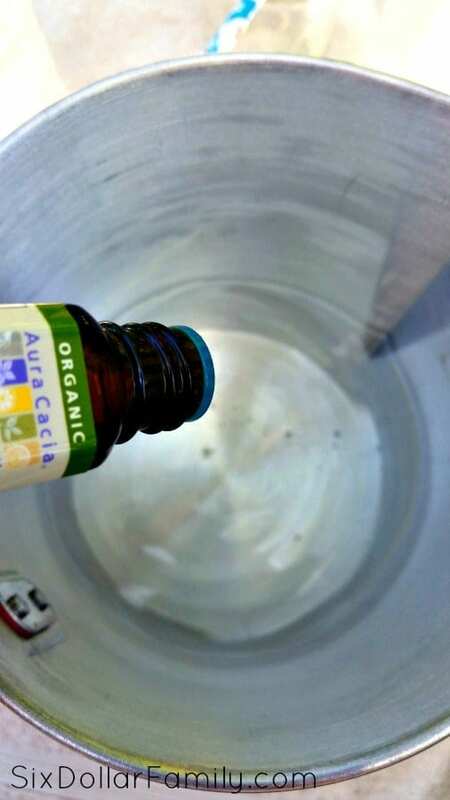 They’re super easy to make and work great as a natural mosquito repellent! 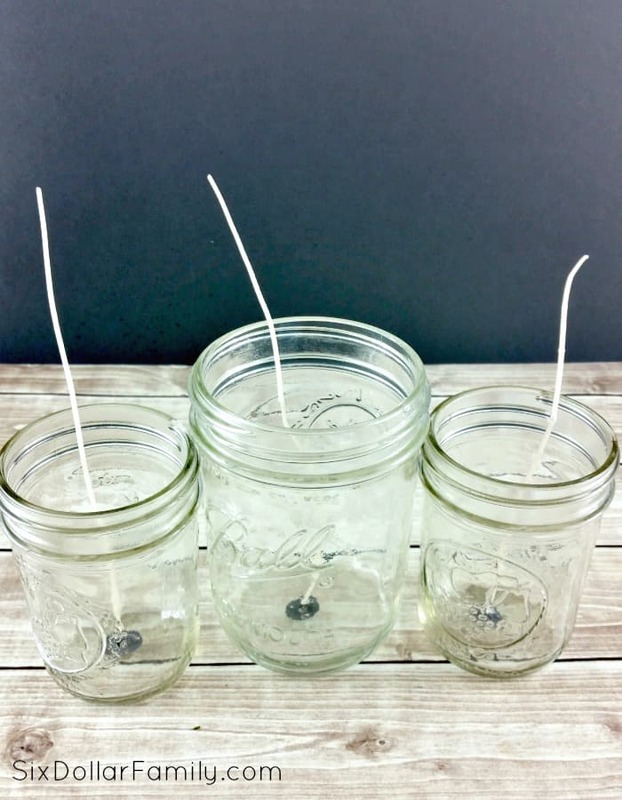 Even if you’ve never made a candle before, these DIY citronella candles are easy enough to make that I’m positive you’ll have no issues! My Emma makes them for us each year and she loves it! She’s actually considering starting her own candle making business now since these are so easy to make! They’re also one of my favorite ways to upcycle empty bottles since you can make them in any clean, empty glass container. For gift giving, we prefer to use different sizes of mason jars as you can see above. It’s helpful if they have a lid so you can keep dust and things from getting onto the top of your homemade citronella candles, but it isn’t necessary. Lid or not, they’ll still work as a fantastic natural mosquito repellent. 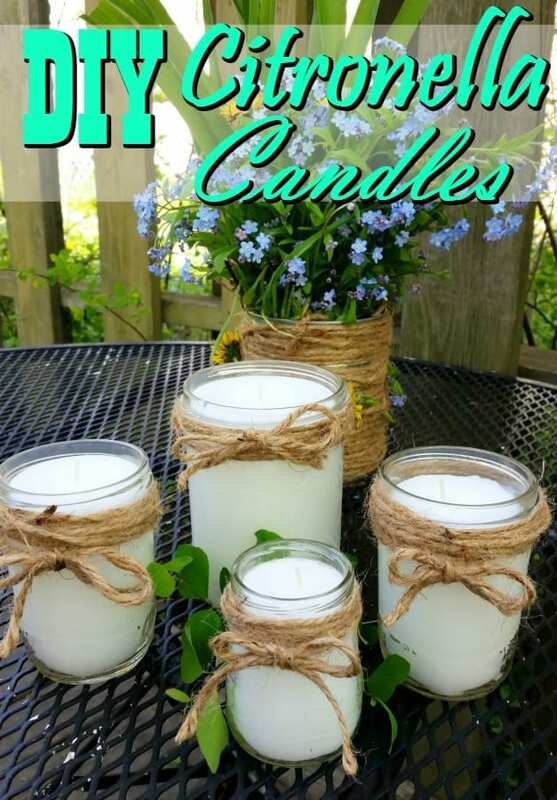 These natural mosquito repellent candles use Citronella essential oil and Lemongrass essential oil. Both are known to repel not only mosquitoes but other creepy crawlies as well. Sure, you can buy Citronella candles already made, but they never seem to work. In my opinion, they don’t have nearly enough oil in them and after the first few minutes, the smell of the citronella oil can’t be smelled by you or the flying buggers that you’re trying to repel. With these, you can make the candle as strong or as weak as you would like meaning they work as a natural mosquito repellent much better. For the Citronella oil, it doesn’t matter which brand you use. There are no regulations for essential oils meaning that anyone can make the claim theraputic grade. Instead, use an oil that you are sure is 100% pure oil and not cut with anything. I personally prefer to use Plant Therapy essential oils, but will use whatever I happen to have on hand. This recipe will make a 1 pint and 2 half pint mason jar candle. 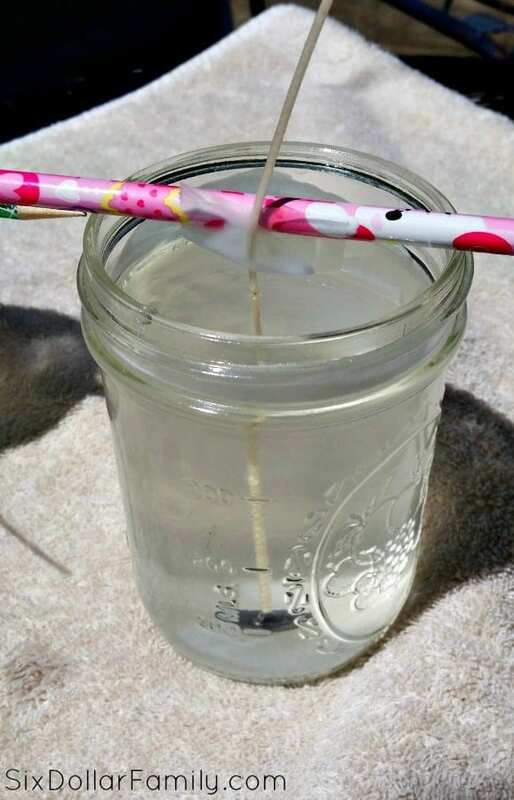 To start making your DIY Citronella candles, take a wick and your hot glue gun. 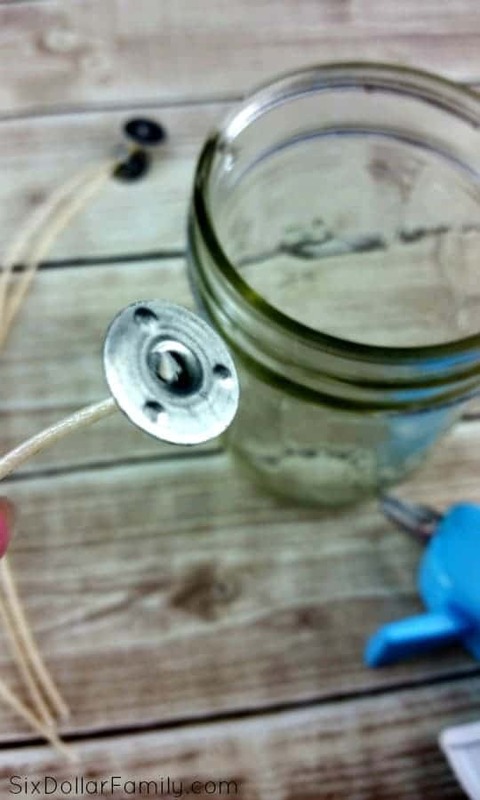 Dab a bit of hot glue onto the bottom of the wick and press into the bottom of your clean and dry glass jars. 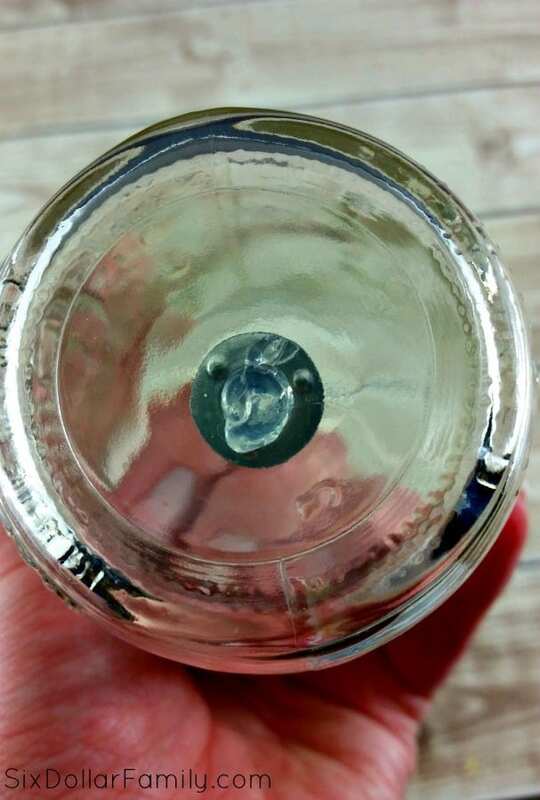 You’ll need to center the wick in the bottom of the jar. I found it was easier to guide and center the wicks while looking through the bottom of the jar rather than the top. Once you’ve got all of the wicks placed, set your jars aside for the glue to dry while you work on the next steps. 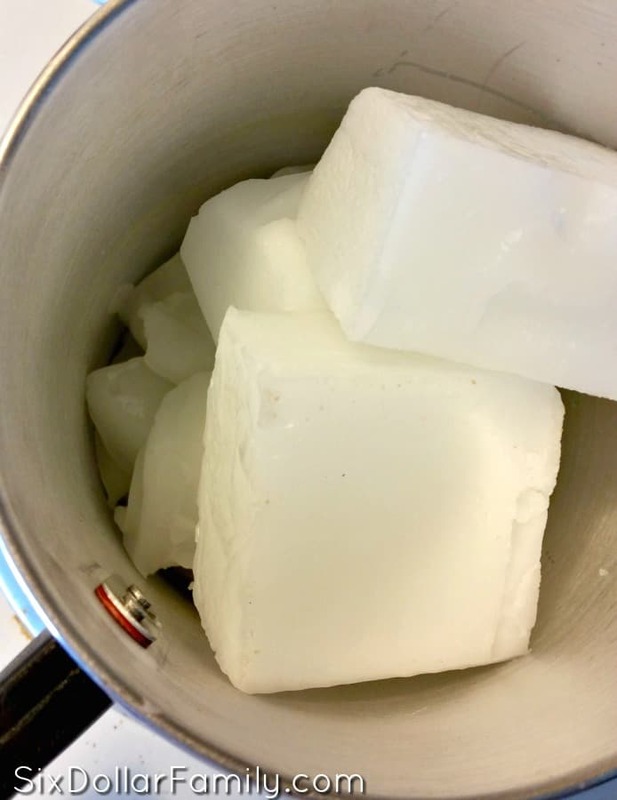 Add your candle wax to your wax melting pot and begin to melt. You can do this two ways. 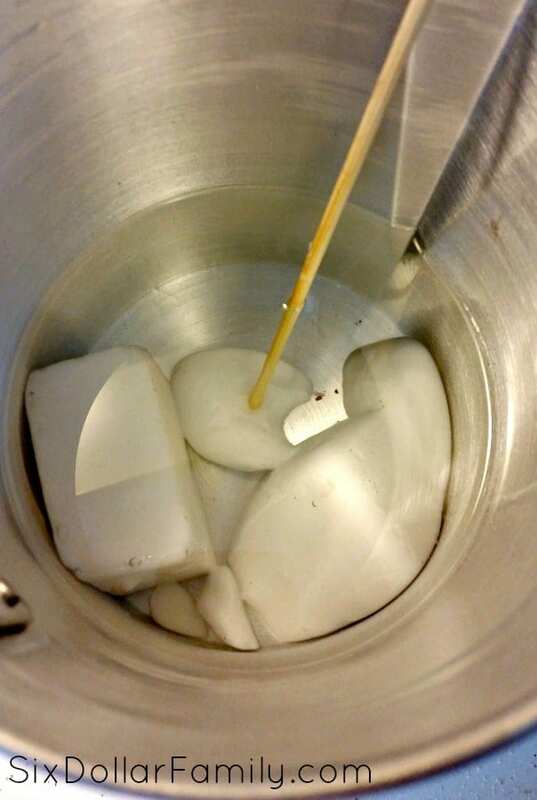 First, you can melt the wax using a double boiler or set the melting pot inside of a pot of lighting boiling water. This method will reduce the chance of your wax burning and will cause it to melt more evenly. The other method is to put your wax pot directly on the burner with medium/low heat going. 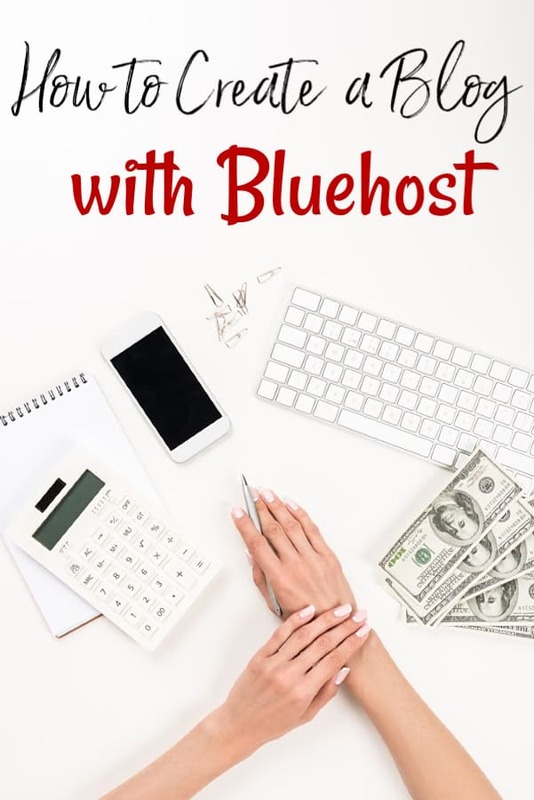 If you use this method, make sure to keep an eye on it very closely. The candle wax is slow to start melting but once it starts, it will melt fairly quickly. Just be sure to keep an eye on it. Once the wax is completely melted, add the citronella oil and the lemongrass oil. We don’t measure when we do our own DIY citronella candles so just use your nose as a gauge. I would also recommend doing this outdoors since the smell of the Citronella can be quite strong. Once you’ve added the essential oil, set the jars on a towel to help prevent temperature shock between the glass jar and whatever you’re sitting it on outside. This can cause the glass to break but the towel will help insulate it a bit. 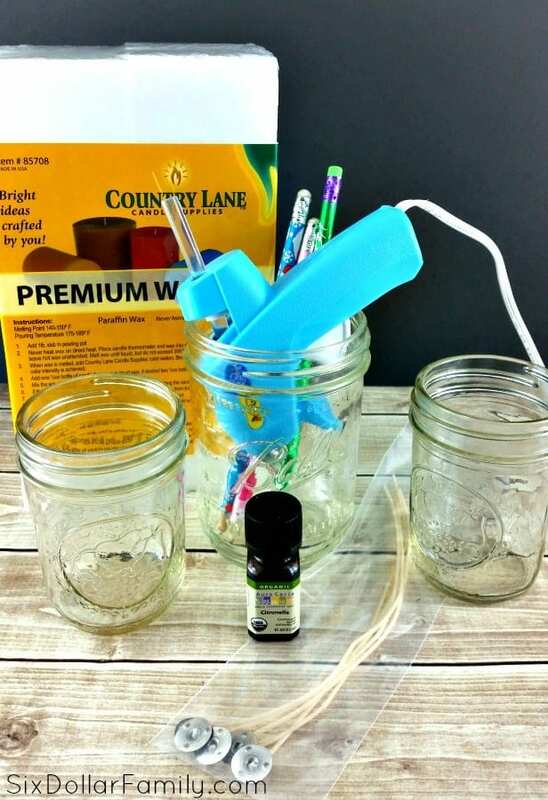 Fill your jars with the wax then tape the top of the wick to a pencil, paper straw or dowel rod to help keep them straight until the wax sets. Set your jars away from direct sunlight and allow your DIY citronella candles to cool completely. Once they’re cool, you may notice that they don’t appear to be as full as you filled them. This is called shrinkage and it is completely normal. Simply add more melted wax to top it off and allow it to harden again. I’d like to try this, but one question. Would you be able to add a little food coloring or something to give the candle a little color? Hey Sarah! I wouldn’t use food coloring, but you could use candle color. It’s available on Amazon HERE. Or maybe pieces of crayons?